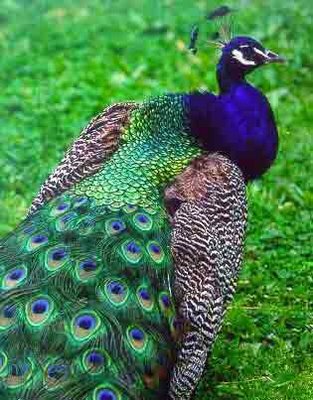 Indian National Bird: The Peacock, Pavo cristatus (Linnaeus), is the national bird of India. Emblematic of qualities such as beauty, grace, pride and mysticism, it is a multihued, swan-sized bird, with a fan-shaped crest of feathers, a white patch under the eye and a long, slender neck. Much in contrast to the natural phenomenon, the male specie of the bird is much more strikingly stunning than its female counterpart. 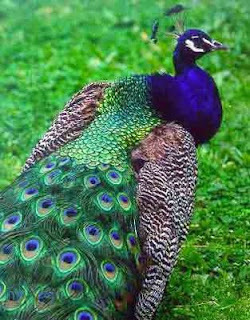 The male bird, peacock, flaunts a gleaming blue breast and neck and a spectacular bronze-green train of around 200 elongated feathers. It is capable of extending its tail erect like fan as ostentatious display. The elaborate courtship dance of the male, fanning out the tail and preening its feathers is a beautiful sight. On the other hand, the female bird, peahen, slightly smaller than its male counterpart. Brownish in color, the female bird also lacks the train visible in the male specie. Peacock is predominantly found in the Indian sub-continent, ranging from the south to east of the Indus river. Jammu and Kashmir, east Assam, south Mizoram and the whole of the Indian peninsula also is home to this impeccable bird. The bird lives in jungle lands near water and is thus, chiefly found in the wilds in India (sometimes, domesticated in villages as well). Peacock is illustrated in pictures accompanying Indian Gods and Goddesses. The sacred bird of the India, the bird was once bred for food, but now hunting of peacocks is banned in India. It is protected not only by a religious sentiment, but also by parliamentary statute. Peacocks have been given full protection under the Indian Wildlife (Protection) Act, 1972. Apart from India, it is also involved to the cultures prevalent in Far East, Ancient Persia, Greek and Christian. While the figure of peacock features in various Islamic religious buildings, the bird is symbolic to 'Resurrection of Christ' in Christianity.